Have you heard the expression, “total Betty?” I first saw it years ago when we made a pilgrimage to Graceland, like every red-blooded American must do. Out on the front rock wall amid all the other graffiti some insightful person wrote, “Elvis is a Total Betty.” I figured this must be a good thing. As it turns out, Bettys is a total Betty too. 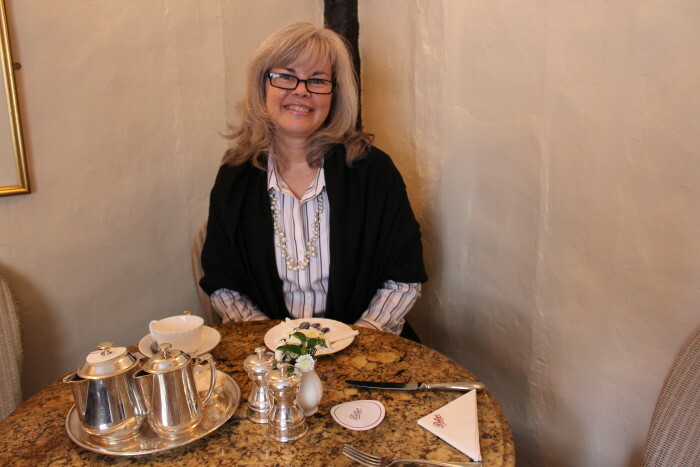 On our whirlwind trip through the U.K. we stopped in York and I had to visit Bettys. However, sometimes when you travel you simply wear out. I want to thank my friend who encouraged me to stick with my plans after I was tempted to skip it to rest a little. A nap sounded heavenly. “You must go!” she said after I had been babbling about it for days to anyone who would listen. 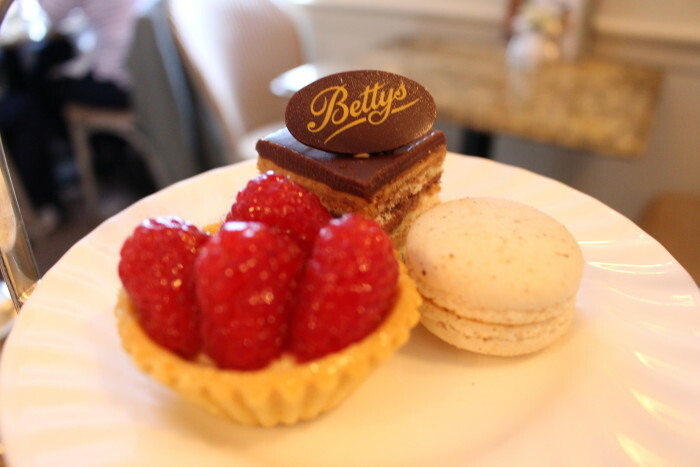 I’ve read articles about the famous Bettys for years and I was so excited to know we’d be in the vicinity – so I gave myself a pep talk and off we went. 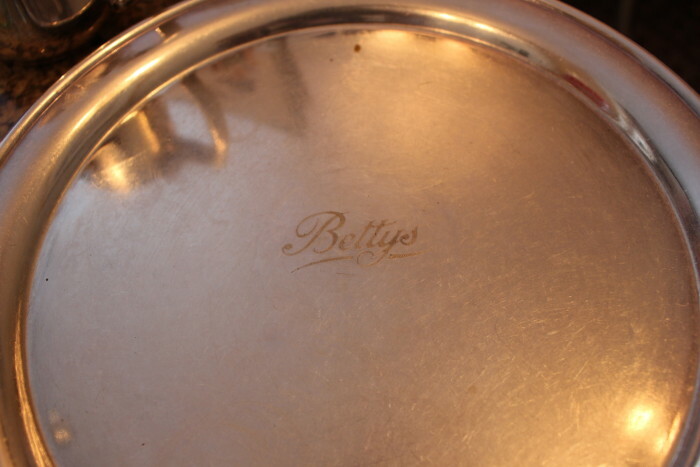 Just so you know, Bettys has many accolades and many fans but no apostrophe. There are six locations, two are in York. 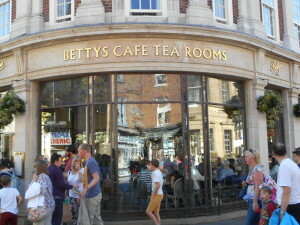 The original Bettys is right in the middle of the main tourist drag in St. Helen’s Square. We had been warned to expect long lines and found it to be true. There was at least an hour wait for a table. Since we were again on a timetable, we walked a few blocks down the road, turned right, walked a few more blocks and there we were at the second, smaller Bettys location in York. The wait there was only 10 minutes. 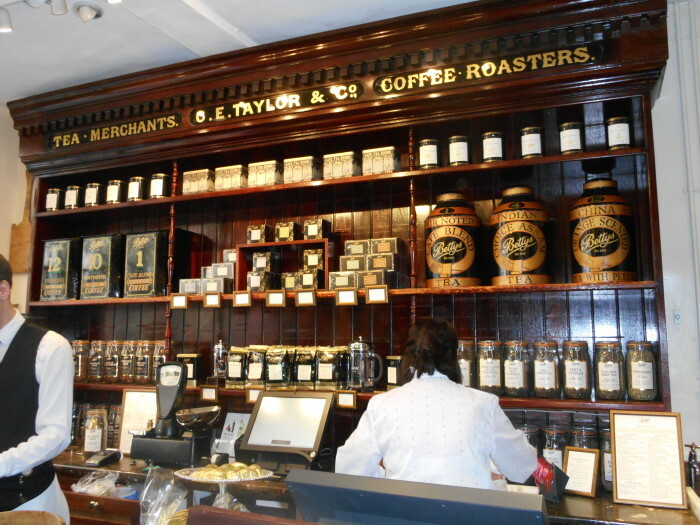 Friendly shopkeepers on the main floor will help you with your pick of tea, cookies, or any other goodies on their well-stocked shelves. 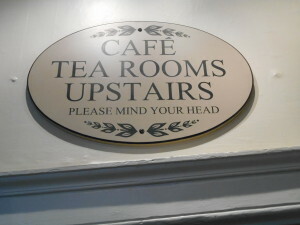 Head on up for tea. 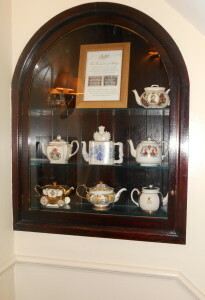 Teapots in a little niche on the way up the stairs. The upstairs restaurant reminds me of a very old house, which it probably is. The rooms are smallish and the areas are cut up with wavy floors but all this just adds to the character of the place and its turn of the century charm. Bettys opened in 1919 so perhaps they’ve retained a bit of style from their past right down to the staff uniforms – old fashioned blouses, full skirts and aprons for the women, and vests and aprons for the men. Tea is served at our nice little corner table. You may wonder, as I did, why are there two teapots? I’m glad you asked! They’re not both teapots. The bigger one is the teapot and the smaller one contains hot water for refills. This is very smart! Why? Because the tea leaves are in the teapot steeping. You don’t want all that water in one pot because the tea would just oversteep before you could drink it all and it would become bitter. Our very efficient and pleasant server recommended the Ceylon Blue Sapphire tea. It is exclusive to Bettys so I tried it and was glad I did. 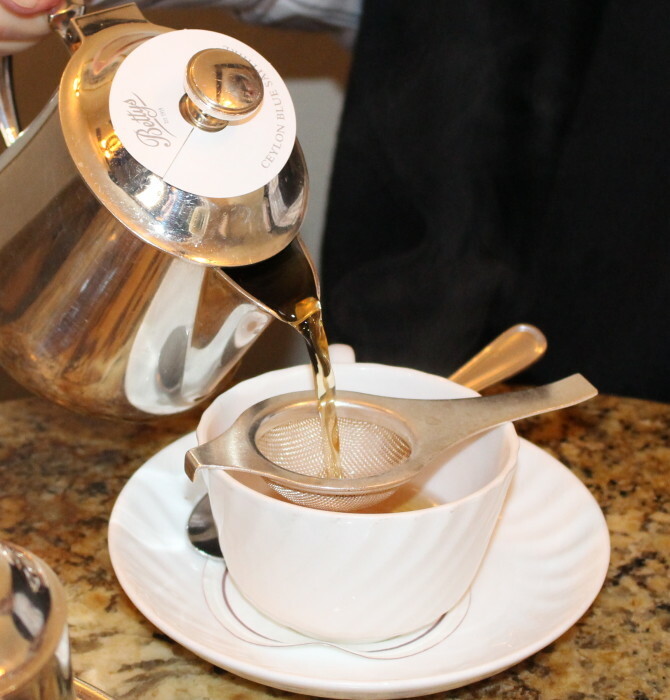 This tea is what you think of when you think of classic full-bodied tea. Ceylon tea is grown in Sri Lanka, once known as Ceylon. It is strong, clean and smooth. Very delightful! I enjoyed it so much I ended up buying some and brought it home. I’m still enjoying it. Blue sapphire is a reference to the blue cornflower petals added to the blend for decoration. The cornflower doesn’t add any detectable flavor though. It’s straight up black tea. And now for the goodies! with the edges trimmed and cut in fourths. One sultana scone served with strawberry preserves and Yorkshire clotted cream. Translation: in the U.S. sultanas are called golden raisins. For dessert I had a light, crunchy macaron, a dainty Opera cake with coffee flavored chocolate icing and a raspberry fruit tart. The fresh and juicy raspberries made this lemony tart my favorite. 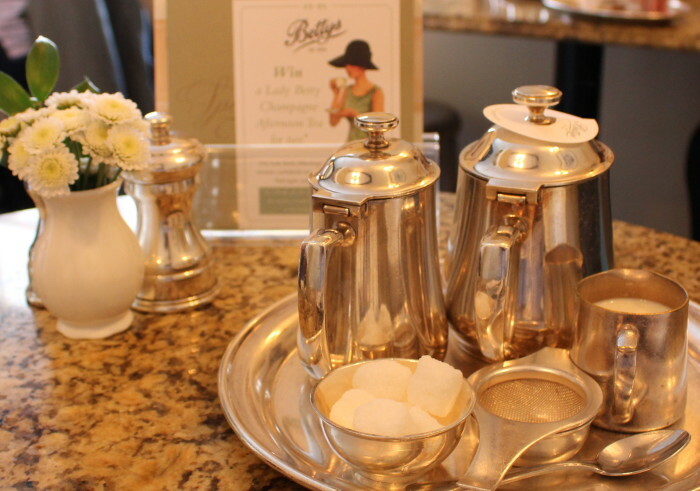 Bettys serves more than just afternoon tea. If you go you will have a full menu to choose from including breakfast items served all day, soups, sandwiches, salad, pasta and quiche. Mr. MD was with me and had a turkey club sandwich that he really enjoyed along with a coke – no fancy food for him, thank you very much. 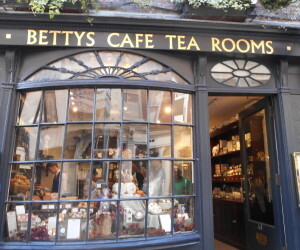 However, he patiently indulges my tea adventures and we both enjoyed Bettys. There’s a little bit of something for everyone there. Their prices are very reasonable. 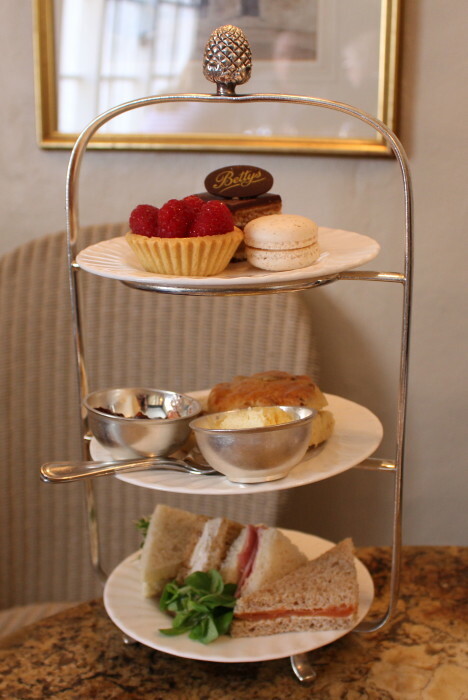 Bettys Traditional Afternoon Tea is £18.95 and £10.50 for the Club Sandwich. A closer look at the desserts. They’re worth a closer look. Goodbye Bettys! It was a real treat! 6 Responses to Bettys is the Best! Kitty, I am enjoying these posts so much. It is a great way to relive our fantastic trip. So glad you went to Bettys! Next up? Keep an eye out. We experienced the good, the quick and the bad! Wow! That was fun. Thanks, Kitty. Thanks for your comment. It was fun! I’d go back anytime.